As the CRC approaches, it's time to ask ourselves, WWJJD? By Hart Noecker of Portland, Oregon. Hart describes himself as a filmmaker and livable streets activist originally from Lansing, Michigan. It was recently reported that the highly controversial 12 lane Columbia River Crossing freeway expansion has finally received an overhaul of sorts. For years, citizens, activists, planners, architects, climate-hawks, and budget-hawks alike have been criticizing the project's runaway cost, destructive environmental implications, and general aesthetic despair. Alternate proposals urging smarter, greener, cheaper solutions offered by our community have been roundly rejected by paid freeway proponents. So it was with much hope and anticipation for correcting the scope of the CRC that the public finally received the news; the I-5 freeway expansion was to be born anew as the BrRP (Bridge Replacement Project), with no change to the plan whatsoever. Can't sell the people on a public relations disaster? Well shoot, just rename the thing, who'll notice?! CRC supporters are suffering from cognitive dissonance if they think a cringe-worthy rebranding attempt will make the public forget the facts. Temporary short-term job gains will be nullified by the demolishing of some 70 businesses on Hayden Island to make room for the 600 foot wide, 22 lane interchange. Adding more lanes will not relieve traffic, it will incentivize more congestion, more pollution, and more carbon emissions that will worsen our climate crisis. Tolling will fall far short of providing the cash needed to pay off the project, leaving taxpayers to pick up the tab while the rest of our state's roads continue to deteriorate. The price tag of $4.2 billion has been projected to balloon to as much as $10 billion dollars by the end of construction. The number of falsehoods and outright lies being sold to the public could fill a phone book. This is nothing new. Portland has been fighting the same battle for half a century, as have Americans in metropolises across the nation. At the same time concerned citizens were liberating Portland's waterfront from Harbor Drive, while also preventing quiet Division street from being mutated into the 8-lane Mt. Hood Freeway, a tenacious Pennsylvania-born journalist named Jane Jacobs was struggling to save the heart of New York City from the kingpin of freeway development, Robert Moses. Having designed car-dominated highways the world over, Moses is responsible for most of Portland's built (and unbuilt) freeway system. He longed to penetrate the core of New York's densest borough with 10 lanes of elevated asphalt. The Lower Manhattan Expressway and subsequent "redevelopment" projects would have demolished numerous neighborhoods including SoHo and Greenwich Village, displacing and destroying the homes of thousands of families. At the time, developers and planners viewed inducing more traffic as being essential to economic prosperity - never mind the people who have to breathe air and cross streets choked with an armada of automobiles. Jane Jacobs had no formal education in urban planning, but she did posses powers of observation of which Moses was incapable. In 1961 she published 'The Death and Life of Great American Cities', a book that would go on to revolutionize the way planners considered the impacts of urban development. Moses was content to look down on cities from a God-like perspective, using maps and models to make sweeping decisions with little care for the people connected to the cultural landscape below. Jacobs attacked this dehumanizing practice. She argued that all urban planning must account for the human relationships and interactions that occur at street level - where people have conversations, engage in eye contact, laugh together, buy goods, share gossip, cook food, where children play and grow up learning together. 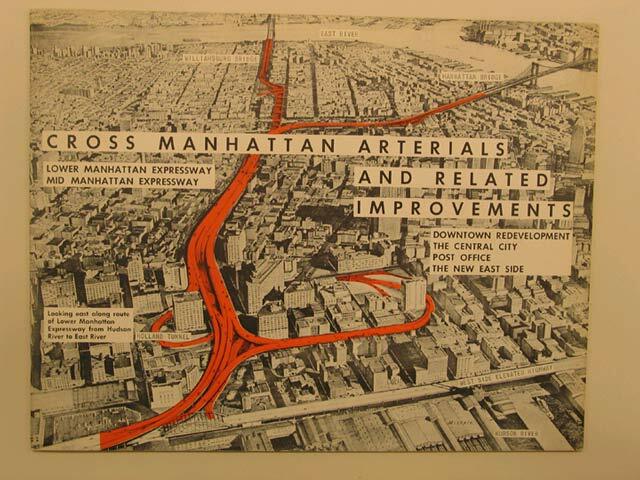 These are essential places that cannot exist within the incompatible freeways Robert Moses fetishized. Beyond her writing, Jacobs became a relentless lion of activism and organizing. Communities joined to confront Moses' plans, hundreds of people at first, then thousands. Meetings filled with denizens, often overflowing into the street forcing larger venues to be sought. Public hearings were standing room only, packed with angered opposition to an expressway leveling so many businesses and homes. Jacobs was even arrested for "inciting a riot" at one particularly charged forum. The community was taking control of their streets. A peoples' movement was growing. The fight to save New York City from the Lower Manhattan expressway went on for years, and rightfully the public prevailed. As with the defeat of the Mt Hood Freeway, the story of the meager Jane Jacobs toppling the mighty Robert Moses teaches a powerful lesson; that when big monied interests threaten our way of life, it is imperative we organize in order to attain victory. To fight back, we must gather together. Corporations profiting from the CRC freeway expansion have the money to send their high-paid lobbyists to Salem with orders to buy funding votes this next legislative session. But we, the public, have each other. We have the authority to stop this mistake before it's too late. Please join Bike Walk Vote for an evening of food, drinks, and democracy this Friday, February 1st at Cránk bike shop, 2725 SE Ash Street. Bring your mind and your voice, and be ready to learn how we as a community will stop the Columbia River Crossing. Event page here.